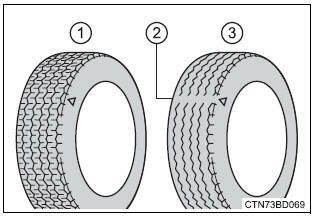 The location of treadwear indicators is shown by the "twi" or "ƒ´" marks, etc., Molded on the sidewall of each tire. Check spare tire condition and pressure if not rotated. Your vehicle is equipped with a tire pressure warning system that uses tire pressure warning valves and transmitters to detect low tire inflation pressure before serious problems arise. If the tire pressure drops below a predetermined level, the driver is warned by a warning light. When the tire inflation pressure is changed such as when changing traveling speed or load weight. Park the vehicle in a safe place and turn the engine switch to the "lock" position (vehicles without a smart key system) or off (vehicles with a smart key system). Turn the engine switch to the "on" position (vehicles without a smart key system) or ignition on mode (vehicles with a smart key system). Vehicles without a smart key system: wait for a few minutes with the engine switch in the �on� position and then turn the engine switch to the �acc� or �lock� position. As an improperly stored spare tire may cause damage to the wire cable that holds it, check that the spare tire is stored properly on a daily basis. If the stored spare tire is slanted or causes a rattle while driving, properly store the spare tire by following the tire change procedure correctly . If the spare tire is slanted, the hoist assembly may be stuck in the wheel opening. If the spare tire rattles while driving, it may not be fully raised. Lower the spare tire to the ground and make sure that the hoist assembly is perpendicular to the wheel opening. Raise the tire slowly and steadily until a click is heard and the jack handle skips. If the spare tire cannot be lowered, the wire cable may be severed. Have the vehicle inspected at your toyota dealer. Make sure to carry out initialization after adjusting the tire inflation pressure. Also, make sure the tires are cold before carrying out initialization or tire inflation pressure adjustment. 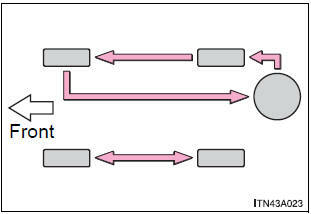 If you have accidentally turned the engine switch to the "lock" position (vehicles without a smart key system) or off (vehicles with a smart key system) during initialization, it is not necessary to press the reset switch again as initialization will restart automatically when the engine switch has been turned to the "on" position (vehicles without a smart key system) or ignition on mode (vehicles with a smart key system) for the next time. 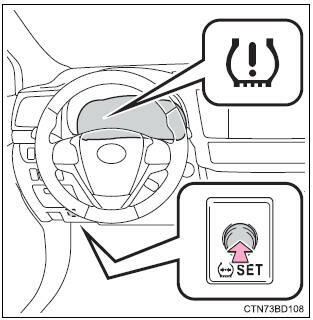 If you accidentally press the reset switch when initialization is not necessary, adjust the tire inflation pressure to the specified level when the tires are cold, and conduct initialization again. After carrying out the initialization procedure, the tire pressure warning light blinks for 1 minute then stays on after driving for 20 minutes. : changes or modifications not expressly approved by the party responsible for compliance could void the user�s authority to operate the equipment. l�utilisateur de l�appareil doit accepter tout brouillage radioélectrique subi, même si le brouillage est susceptible d�en compromettre le fonctionnement. : this device complies with part 15 of the fcc rules. Operation is subject to the following two conditions: (1) this device may not cause harmful interference, and (2) this device must accept any interference received, including interference that may cause undesired operation. Fcc warning: changes or modifications not expressly approved by the party responsible for compliance could void the user�s authority to operate the equipment. : operation is subject to the following two conditions: (1) this device may not cause interference, and (2) this device must accept any interference, including interference that may cause undesired operation of the device. : l�utilisation de ce dispositif est autorisée seulement aux deux conditions suivantes : (1) il ne doit pas produire de brouillage, et (2) l�utilisateur du dispositif doit être prêt à accepter tout brouillage radioélectrique reçu, même si ce brouillage est susceptible de compromettre le fonctionnement du dispositif. These conditions may cause losses in tire inflation pressure, reducing the cushioning ability of the tires. In addition, driving on rough roads may cause damage to the tires themselves, as well as the vehicle's wheels and body.